Participants show off during the Fourth Nanshan Swimsuit Skiing Carnival held at the Nanshan Ski Resort in suburban Beijing on Sunday. Skiers were encouraged to wear swimsuits, outrageous costumes and make-up to win the favours of the judges. 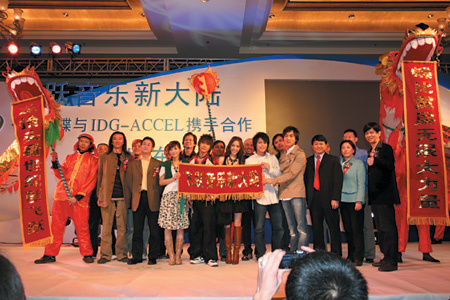 On March 2, Bi Xiaoshi (first from right), GM of Ocean Butterflies Music in Beijing, and contract singers celebrate with their investor representative Li Jianguang (fifth from left) from IDG-ACCEL, a joint venture of American International Digital Group and Accel Partners. Miriam Yeung and Richie Jen, pop singers and movie stars from China's Hong Kong and Taiwan, show up at a press conference promoting their new movie "2 Becomes 1" in KunTai Royal Hotel on Monday. 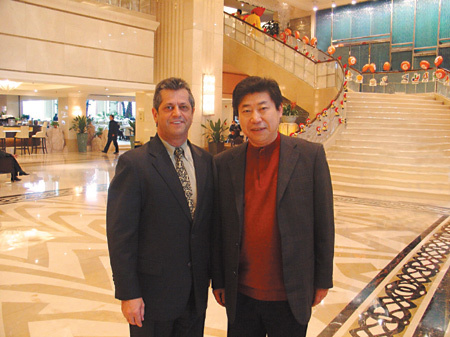 Zhang Jilong (right), vice president of the Asian Soccer Federation and the Chinese Soccer Association and head of the Sports Department of BOCOG, meets with Roland Steiner, GM of Crowne Plaza Park View Wuzhou Beijing, before a press conference held there on Monday. 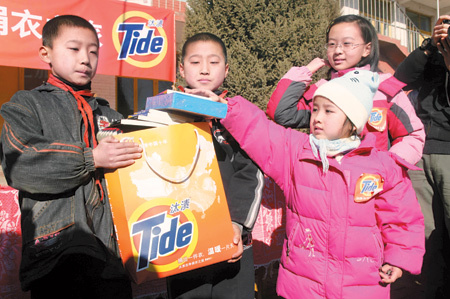 Children donate clothes and books in a three-month-long charity event launched by several organizations, including China Charity Federation and Tide brand of P&G group.